During your detox diet you may be well aware of the foods you can’t eat, but less sure of those you can. With a little imagination there’s no need to feel deprived - see your detox as an opportunity to try new foods and form eating habits that last long after your diet has ended. 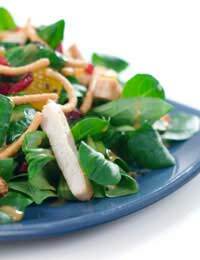 With a diet rich in fresh raw fruit and vegetables, it’s no surprise that many detox lunch ideas will centre around salad of some kind. To avoid boredom and explore new tastes, try combining foods you’ve never tried – the more colourful, the better! Greek salad (minus the feta cheese) will make a great change, and add brown rice to add fibre and ensure you stay full up until your next meal. If you prefer a hot meal at lunchtime try steaming some vegetables, serving them with some fresh fish. Steaming helps to conserve the nutrients in vegetables, and if you can’t face them raw, this is the next best thing. Poached or grilled fish will make a great source of high quality protein, and together with your vegetables will make a good, balanced meal. One thing you may notice on a detox diet is that your food tastes rather bland. This is because your taste buds have become used to processed, salt and sugar-laden foods and those loaded with artificial flavours. Enjoy the feeling that a detox diet will reset your sense of taste, and add garlic, herbs or ginger to give your lunchtime meals a kick. To keep your detox lunches interesting and delicious, experiment with different vegetables and different ways of serving them. For example, if you’ve been used to slicing up peppers and popping them in a salad, why not leave them whole and stuff them instead? Brown rice makes a great base, and to that you might add beans, onion, mushroom, tomato and anything else you like to eat. When your diet is restricted, variety of this kind really will be the spice of life. If you fancy something substantial and detox friendly, don’t overlook the humble baked potato. An oven-baked, crispy skinned potato is one of life’s best simple meals, to which you can add vegetables, tuna or salad, to name but a few. A baked potato makes a filling and versatile meal, perfect for a cold winter afternoon or on a warm day with a summer salad. Live natural yoghurt with fresh fruit and honey makes for a delicious lunch. Use any combination of fruit you like and sweeten to taste with the honey for a summer holiday inspired meal. You can adapt your fruit choices according to what’s in season and what’s available locally, too. In season fruit will taste delicious and keep your carbon footprint to a minimum. With a little enthusiasm your detox diet will be just the start of a bigger change to your lifelong eating habits. A plate full of fresh, organic, nutrient-packed produce beats the alternatives, hands down.